Not content with offering everything from modular rifles to full on plastic gun emplacements, Nerf has now turned its attention to rapid-fire vehicles as well. The Hasbro-owned brand is about to launch a new range of blasters and launchable foam vehicles. The Nerf Nitro range is the product of two years worth of research, with the end result enabling kids both big and small (it's for ages five and up) to load up a special launcher with foam cars and fire them at ramps, obstacles and more. 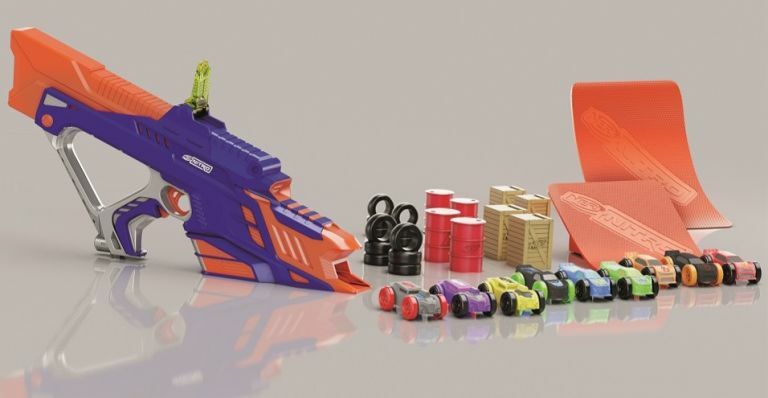 Nerf Nitro collectible line features more than 48 vehicles designs at launch, and includes sets ranging from the 24-piece MotoFury Rapid Rally set, to the two launcher DuelFury Demolition set. No news on final prices as yet but Hasbro has confirmed the range will launch later this year. If you're planning to travel abroad and want to keep connected without suffering catastrophic roaming fees, then the new Konnect i1 from Nuu Mobile is the global roaming device for you. From one small little package in your pocket or bag, you can connect to Wi-Fi hotspots in over 100 countries - and you can do it all without a contract or any nasty sign up fees. Nuu Mobile says it offers, "the lowest roaming fees, fast upload/download speeds and a secure VPN connection that protects sensitive material," and can connect up to five different devices while switching between a SIM bank and a Multiple Network Identity e-SIM. Offering local country rates for 4G LTE data and a 10-hour battery life, the Nuu Mobile Konnect i1 will arrive in 2017. No price confirmed as yet. If you're looking for a one-stop grooming package, Braun's latest edition of its versatile Multi Grooming Kit. The Braun Multi Grooming Kit MGK3080 includes a detachable smart clipper comes with 13 precise facial hair cutting settings offering lengths between 0.5 and 21mm. It even comes with attachments for styling your hair, should you need a DIY trim. The package also comes with a free Gillette Fusion ProGlide razor for a super-close and sensitive manual shave, so you're looking at a pretty impressive little package for the hairiest person in your life. The Braun Multi Grooming Kit comes in three versions - one with six attacments (MGK3020 - £29.99), one with eight attachments (MGK3060 - £44.99) and the main one with nine (MGK3080 - £52.49).